relating to the July 5 riots in Xinjiang. 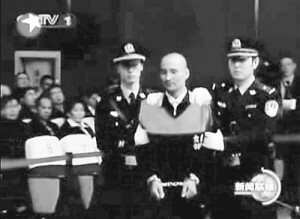 Surprisingly, the China Daily also reported that all trials will be public aside from those involving charges of “splitting the State” and “instigating to split the State.” Because the number of cases involving these charges has not been announced, it is unclear how many of the trials will in fact be public. 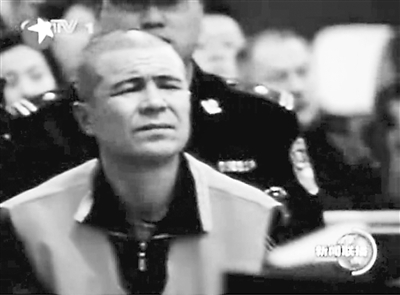 Additionally, officials have yet to announce how many of the defendants are Han Chinese and how many are Uighur; at least some will be Han since the China Daily last week reported that trials of the Han defendants will occur before the Uighur defendants’ trials. The announcement that over 200 people were arrested and face trial in the coming week was a departure from the “small number” originally anticipated. 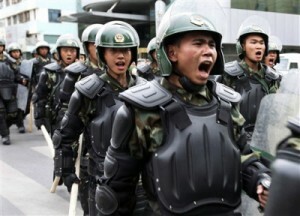 At the beginning of August, the Chinese police stated that out of the 1,600 people detained, only 83 had been arrested. 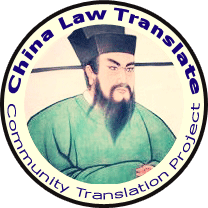 Under the Chinese Criminal Procedure Law, a suspect can be detained for days, and in politically sensitive cases for a good month, without being formally arrested. As with most of the articles concerning the Xinjiang riots, China Daily’s recent report again blamed foreign forces for instigating the riots. 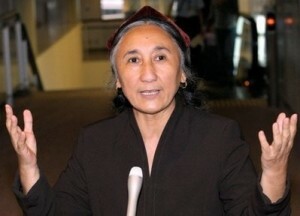 Both the Chinese press and Chinese officials have repeatedly assigned blame for the riots to Rebiya Kadeer, a Uighur woman who was granted political asylum in the United States in 2005. 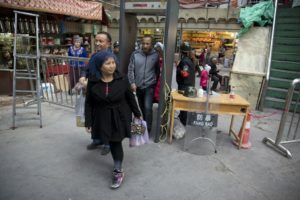 Once viewed as a model minority by the Chinese government because of her successful businesses in Xinjiang, Ms. Kadeer soon fell out of favor when she began to support Uighur causes. Jailed in 1999 for allegedly passing state secrets, Ms. Kadeer was freed to U.S. custody in 2005. Since then, she has become president of the Uighur American Association and the World Uighur Congress. Because the Chinese government is intent on presenting an appearance of a “harmonious society,” it is essential that it seeks to blame outside forces when discontent is presented by some of its minority groups, regardless of the claim’s validity. After the March 2008 protests and riots in Tibetan areas of China, the Chinese government vilified the Dalai Lama, accusing him of being the mastermind behind the riots. However, the government never provided any evidence to support the claim that the Dalai Lama was involved (see Premier Wen Jiabao’s statements here). 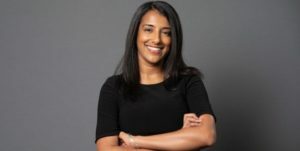 Similarly, with Ms. Kadeer, the Chinese government has accused her of organizing the riots from her home in Washington, DC (for a scathing critique of Ms. Kadeer in the Chinese press, click here). While the Chinese government claims to have a recording of a phone call to her brother allegedly evidencing her role, this recording has never been made public. Interestingly though, China’s denunciation of the Ms. Kadeer might have the unintended consequences of designating a leader of a movement that up to this point was without one. Tibetans easily rally around the Dalai Lama since he is their spiritual leader. But for Uighurs, there have been few that have reached the level of the Dalai Lama and symbolize their culture and religion quite the same way. However, by continuously pointing to Ms. Kadeer and accusing her of masterminding the riots, the Chinese government may have inevitably provided the Uighur people and the Uighur movement with a much needed leader. The China Daily reported on Friday that trials of a “small number” of the people involved in the July 5 Xinjiang riots will begin by the middle of August. With over 1,600 people detained, what is considered a “small number” remains unclear. Also unclear is what number of the people tried will be of Uighur background. Given that violence in the region appeared to be spurred by both Uighur and Han, some of the “small number” should include Han Chinese. 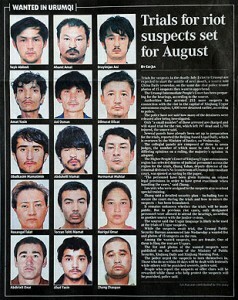 But in a recently issued “most wanted” list relating to the July 5 riots, 14 out of the 15 people are Uighur. (1) Public trials can ease foreign criticism. 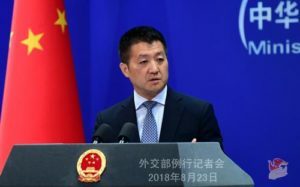 The international press, including papers in the U.S., Europe and the Middle East, followed the Xinjiang riots closely and will be publicizing the verdicts of the trials. But if the trials remain closed, the press is left with nothing but rumors from inside the courtroom. Rumors are what started the riots in the first place (see previous post). Additionally, authorities in Urumqi, Xinjiang’s capital, have taken extra care to train court personnel who will be working on the trials and have provided specially trained lawyers to the defendants. Assuming that the training efforts have been undertaken to provide a fair trial to defendants, this could be an opportunity for China to show publicly the development of their criminal justice system. And while there will likely still be foreign criticism of the proceedings (see all the criticism by the U.S. media regarding the criminal trial of Amanda Knox in Italy), such criticism will be based upon fact and not on mere speculation. (2) Provide an outlet for the Uighur community and limit future riots. The Uighur community in both Xinjiang and outside of China, will be watching the proceedings closely. Again, without a public trial, rumors will start and resentment will continue to breed among the Uighur community. A public trial on the other hand allows the Uighur community to see how justice is served. Will the community still have complaints? Of course. 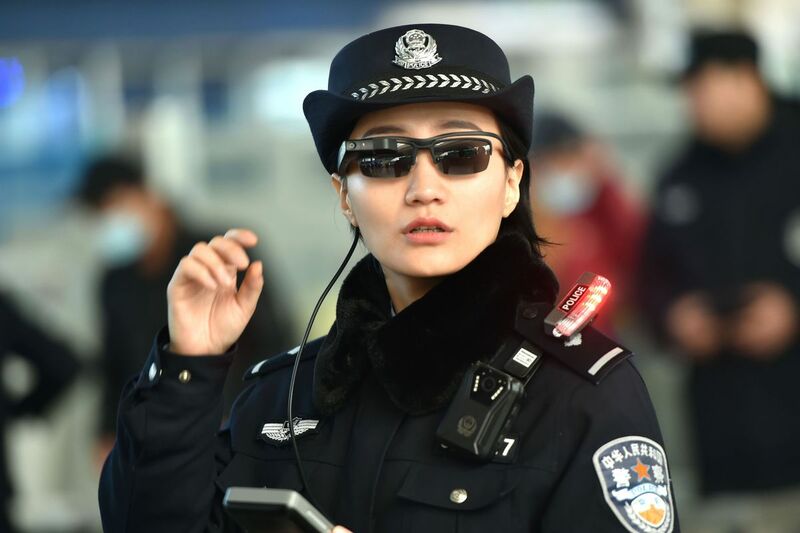 But there is a greater chance that if China is more transparent, the Uighur’s complaints will be lodged directly, and civilly, with the Chinese government. If there is a belief that the system is fair, then there is a greater chance that the system will be respected, complaints will be lodged within the system, and violent protests will be limited. A fair system by definition is a transparent one. As the Olympics showed, China can certainly put on a phenomenal show (if not the best Olympic show ever). However, part of being a world power is to be constantly on display; China cannot confine international focus to only its most glamorous moments. Rather, as a global leader, the world will be watching how China makes it through its more difficult episodes. In discussing the recent riots in Xinjiang, yesterday’s post focused on who the Uighurs are and what initially caused the riots in Xinjiang’s capital, Urumqi. But there is more to the riots than a single incident of violence that occurred thousands of miles away. In Part II of “Xinjiang Riots – A Primer,” we examine the underlying tensions between the Uighurs and the Han that have been brewing for years as well as explore the rumors that started all of this violence. What are the underlying tensions between the Uighurs and the Han? While the violence perpetrated by both the Uighurs and the Han is equally condemnable and nothing can justify it, the fact that such violence can escalate so rapidly over rumors circulating from a town thousands of miles away makes one wonder why. 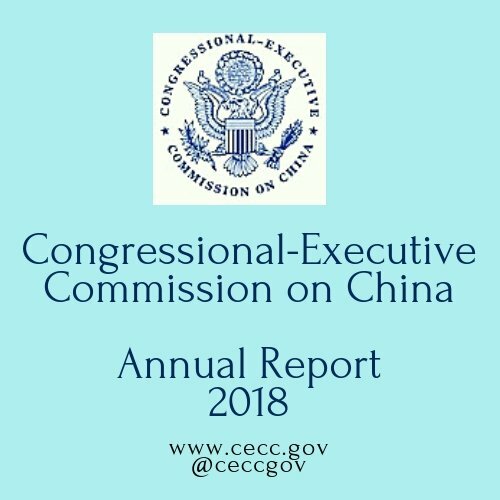 To understand the tensions that run just below the surface in Xinjiang, it is essential to examine the Chinese government’s policy toward the province during the past 10 to 15. In an effort to modernize and economically develop Xinjiang, the Chinese government has encouraged companies and people to “Go West” and move to the predominantly Uighur province. 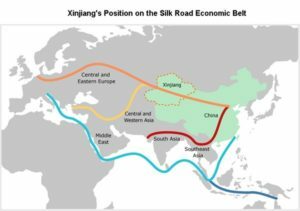 While Uighurs have inevitably benefited in many ways from this economic development, the Chinese government has its own interest in developing Xinjiang. Xinjiang province is rich in natural resources including oil and natural gas, both of which are necessary to fuel China’s rapidly growing economy. In encouraging Han Chinese to develop Xinjiang, the population of the region has been radically altered. In 1949, only 6% of the population was ethnically Han; today, 40% is Han Chinese. Additionally, most of the good paying jobs are taken by the Han Chinese, leaving the Uighurs with an unequal share in the economic development. The Uighurs also have little to no political power. 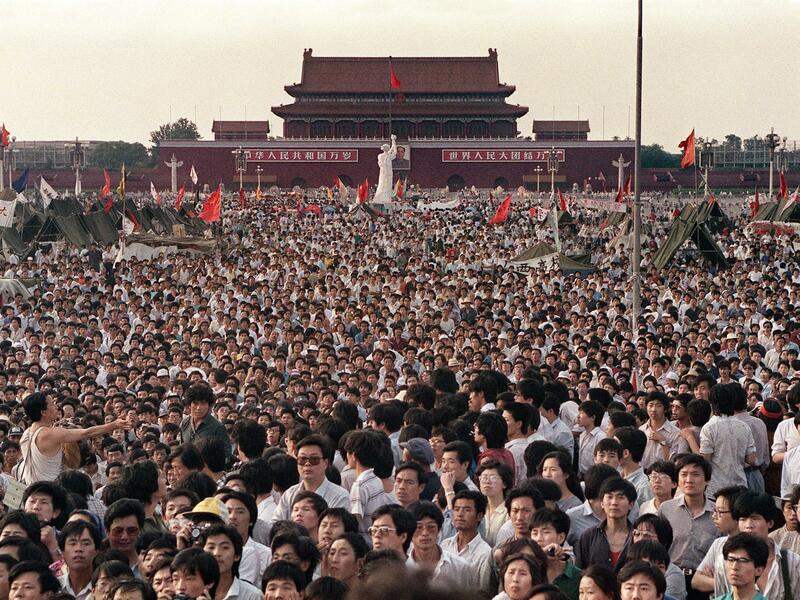 In country where the government is synonymous with the Communist Party (CCP), the only way to play a role in government is to be a member of the Party. However, according to the U.S. Department of State, Party rules still forbid members from professing a religion and requiring expulsion of members who belong to a religious organization. This rule makes it almost impossible for Uighurs to become members of the CCP and thus have an impact on the way Xinjiang is governed. Furthermore, since 2002, the Chinese government began to phase out the use of Uighur in schools (including the elementary level) and universities in Xinjiang. As a result, the Uighurs are left economically and politically impotent while their language is being stamped out, creating the foundations of an easily explosive situation. How could incidents of mass violence start from mere rumors? What is also interesting about the current Xinjiang situation is that both incidents – the one in Shaoguan and the one in Urumqi – were started through rumors, rumors that the press and authorities denied but yet were still able to take hold. In Shaoguan the police and the press both stated that the alleged rapes did not occur. But instead, the Han Chinese believed rumors that the rapes did happen and acted in response. 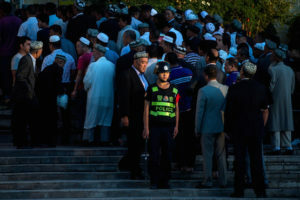 The Uighurs in Urumqi believed that more than two Uighurs were killed in Shaoguan, even if the press and the police both confirmed only two people killed, sparking the July 5 protest and the eventual riots. 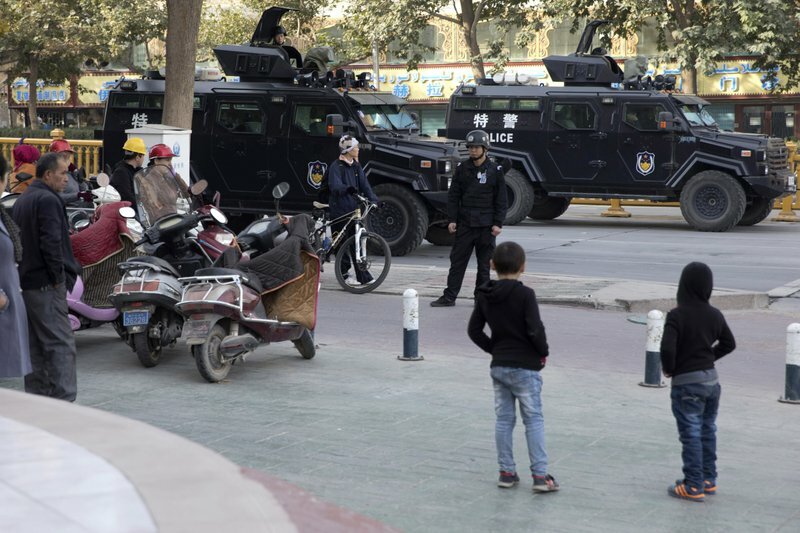 Evidently, the Uighurs and the Han Chinese are united in their mistrust of state authorities and question the veracity of the information supplied by both the police and the government-controlled media. In an era of instant communication, where news can get to people within a matter of seconds, this mistrust in the reliability of government information and the media is a very dangerous situation for the Chinese government. Where the people are more inclined to not just believe rumors, but to act on them, the Chinese government might be wise to reevaluate its current control of the media. On July 5, 2009, Urumqi, the western most provincial capital in China erupted into violence that continues to today. Xinjiang province, an area of China that very few people outside of China have ever heard of, is now front page news in most Western newspapers. While the press has reported admirably about a very confusing situation, below, in the first blog post of two, is some background on Xinjiang province, the Uighurs who live there, and the immediate cause of the riots. The Uighurs (also spelt Uyghers and pronounced “wee-gerz”) are a Turkic ethnic group that largely live in the Chinese province of Xinjiang. The Uighurs speak their own language, a language that is completely unrelated to Mandarin or any other Chinese dialect. Most Uighurs are Sunni Muslims. While ethnically the Uighurs are different from the Han Chinese (the dominant ethnic group in China), the Uighurs in Xinjiang province are Chinese citizens and under the Chinese constitution, enjoy the same rights and privileges as the Han Chinese. 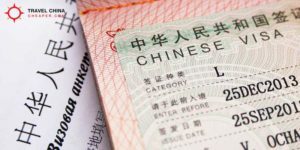 In fact, the Uighurs, because of their status as a minority group under Chinese law, receive certain privileges: they are not subject to China’s one-child policy and are often given preferential treatment for college admissions. While Xinjiang province has been inhabited by western Eurasians for close to 4,000 years, most foreign scholars agree that the Uighurs migrated from present-day Mongolia to Xinjiang during the 10th century. During that time, the cities of Xinjiang, including Kashgar and Urumqi, were important stops on the Silk Road. China did not bring Xinjiang under full control until around 1760, but since then, Xinjiang has been a part of China. For a more detailed article on Xinjiang see “Rumbles on the Rim of China’s Empire” in the NY Times. 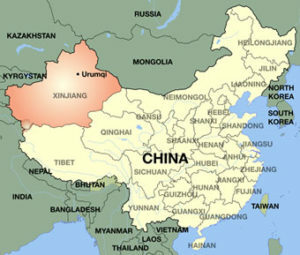 The immediate cause of the protest and ensuing riots is not found in Urumqi or even Xinjiang province for that matter. Instead it is necessary to look to Shaoguan, a small factory town in the southeast province of Guangdong and more than 2,500 miles from Urumqi. Jonathan Watts of The Guardian has done the most extensive reporting in English on what occurred in Shaoguan and his article is a must read. In sum, because of the many factories in the city and surrounding areas, Shaoguan is home to a large number of China’s migrant workers who are employed by the factories. While most of the migrant workers are Han Chinese escaping poverty in the rural areas of China, one toy factory in Shaoguan, encouraged by a government program, hired over 800 Uighur migrants from Xinjiang this past May. Relations between the Han and Uighur workers began to deteriorate rapidly after rumors began to spread amongst the Han Chinese in the factory that Uighur workers raped two Han Chinese women. On June 25, some of the Han workers took out their anger and attacked the Uighurs in the toy factory. By the end of the night, two Uighurs were dead and many more injured. Mr. Watts reports that a participant in the beatings believes that many more than two Uighurs were killed in Shaoguan; potentially as many as 30. However, this man’s account could not be corroborated. Through text messaging and the internet, the Uighurs from the toy factory informed their friends and relatives back in Xinjiang of the murders. 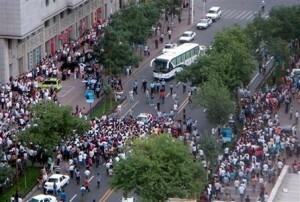 In response, a peaceful protest in Urumqi was organized for July 5. Drawing over a thousand Uighurs, the crowd quickly got out of hand and violence against the Han Chinese in Urumqi ensued. In the following days, the Han Chinese responded in kind against the Uighurs. Today, 184 people are reported dead (although some foreign media outlets put the death toll higher) and violence from both sides continues, with the police unsuccessful in attempting to quell the situation.